It is cold here, 46 degrees. It even snowed in the mountains. My geraniums decided it was a good time to bloom. I do not want to move them inside, but probably should. I know they will die if the temperature gets much colder. I have been playing with Belle’s embroidery option. These were stitched using left over Sulky Rayon thread and Pellon tear-away stabilizer. I want to try the better brands of thread and stabilizers to see the difference. I think these turned out nice though. There are so many pretty designs that come pre-loaded on the sewing machine. I haven’t even started to use the embroidery software yet. I hope to get to that next week. Here is a photo of some of the stabilizers I bought today with a stitch out of some of the stitches that I had heard do not stitch out nicely. They are decorative machine stitches, not embroidery designs. The one on the right is off, but I think I held the fabric to firmly. The other two I think look nice. Decorative stitches take a bit of skill keeping aligned. The one on the left I wouldn’t hesitate to sew out as a decorative stitch. The other two stitches I would stitch in embroidery mode because they take a lot of concentration keeping the fabric straight. Being able to hoop them quickly is one of the things I love about Belle. This entry was posted on Wednesday, December 9th, 2009 at 3:00 am and is filed under Bernina 830, Embroidery and Garden. 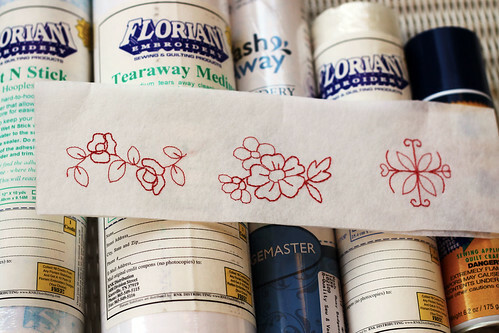 Tagged: Embroidery, Sewing. You can feed this entry. You can leave a response, or trackback from your own site. My geraniums are blooming outside, but the forecast is for 2 weeks of cold weather, so maybe I’ll do something constructive, such as bring them in. Your new machine has some fantastic embroildery designs. I don’t have a sewing machine, but if somebody gave me one like yours I think I would turn into a sewing addict! I’m glad to see what you and Belle have been doing! Your geraniums are such a yummy color! I am always drawn to flowers with a warm coloring – apricots, peaches,etc. 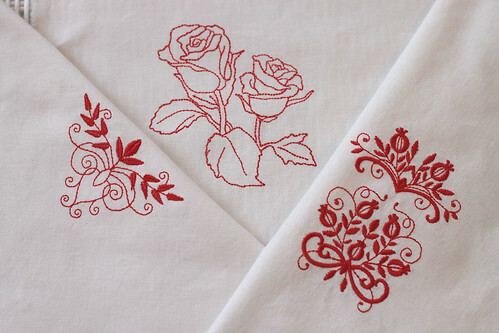 But oh my, love your red embroidery – redwork is also a favorite of mine. It looks like you are getting along really well with Belle! Have a good weekend and take care. Your geraniums look lovely in that photo! 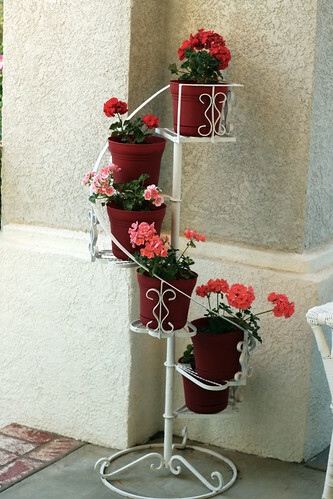 That plant stand is so cool! I hope they are still doing okay. Did you end up moving them inside? The embroidery is lovely. I can’t wait to see the other goodies you create once the software is uploaded for that fabulous machine!